In an effort to easily and quickly provide a healthy breakfast for my family each morning, sometimes I find it helpful to get breakfast made the night before I plan to serve it. 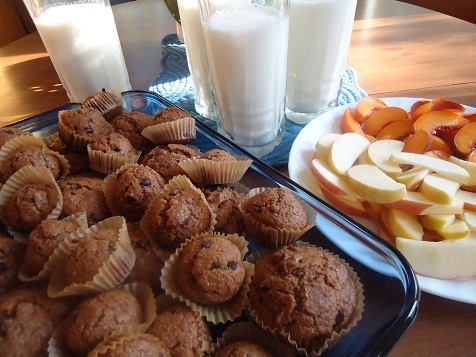 Chocolate Chocolate Chip Muffins and Blueberry Muffins with fruit and milk. Fast, easy, and a total family pleaser. This sometimes means that I bake muffins at night after dinner. Or it might mean that I multi-task while making our evening meal and stir together Giant Breakfast Cookies while our dinner casserole is baking. Or, it might mean that I put together an Easy Breakfast Casserole right before I go to bed so that all I have to do is get up in the morning and put the casserole directly into the oven. 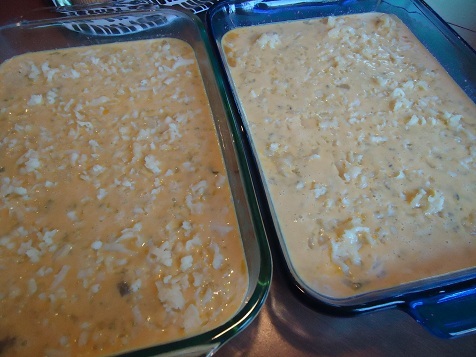 And shucks, as someone quite goofy but very practical once said, “If you’re making one you might as well make two…” Therefore, you might even decide to make an Egg Casserole to bake in the morning…and make a second one to put into the freezer for another morning. What kinds of breakfast foods have you found to be easy to make the night before? I actually made your sausage pancake muffins last night. Reheated them this morning as a quick grab and go on the way to school. I add some sucanat to the batter so they are already sweet and do not need syrup…makes them perfect to eat on the way! Sounds like a great idea. I homeschool and that would be great for the morning. I do have a question Laura. The eggs and the cream freeze fine in the egg casserole? Do you just pull it out of the freezer and put it in the oven or do you have to thaw it first? Thank you for all your great ideas. I read your website every day. I have done this before, and I felt like the result was mediocre. The texture was off, but the flavor was good. I think I thawed mine first, and then baked; so perhaps Laura’s idea will work better. I also love the Pancake Sausage muffins as well. We often have giant breakfast cookies too. Something I enjoy doing is making up a whole bunch of whole wheat waffles on Saturday, freezing them on cookie sheets, and then bagging them up. 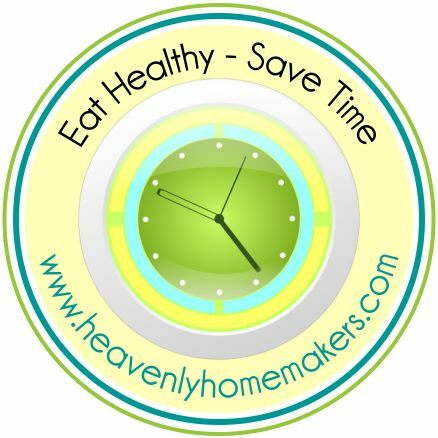 Healthy “eggo” waffles whenever we want them through the week! Our family is a HUGE proponent of preparing as much as possible the night before. This is especially helpful on Saturday nights. No looking for that lost church shoe -5 minutes after we were supposed to leave- on Sunday mornings! Just wanted to tell you I made your turkey sausage and froze them last week. Huge hit! Thanks for a great blog! I think soaking muffin batter the night before and measuring the rest of the ingredients beforehand saves me time. In the morning I add the rest of the ingredients to the soaked mixture and then bake. I also like using dehydrated shredded zucchini and dehydrated shredded carrots in muffins. Just measure out and pour hot water over and set all night. In the morning drain off any excess water and add to muffins. The 2-stage process (soaking) is a timesaver for me because it divides up the whole process which divides up the time. Another plus is the texture of the muffins are very moist. gives me the extra motivation I need. lol. Yes, I couldn’t agree more making it ahead is tremendously helpful! We love making a oatmeal casserole. I put all the dry ingredients in the baking dish and cover. All the wet ingredients I place into a large measuring cup, cover and place in the frig over night. In the morning just turn on the oven mix the wet ingredients with the dry, cut some fruit on top, into the oven it goes for 25 minutes! :) Super easy and delicious. I got the recipe from the link below but streamlined it to make it even easier for mornings. Overnight oatmeal! Oatmeal, chia seeds, milk, yogurt, sweetener (honey, brown sugar, apple sauce etc) left to sit in the fridge through the night, with fresh fruit added in the morning. My whole family loves it so much that my husband has taken over making it every few nights! I make a big pan of baked oatmeal or granola and that is our breakfast for several days until I make a new pan! Works great for us and we don’t miss the variety! Each week I make something “special” on Mondays. The kids get to choose between the special (banana chocolate chip muffins, spiced carrot bread, etc.) or homemade oatmeal packets. We usually run out of the special mid-week (Tuesday if it’s especially popular), but I like the kids to eat their fair share of oatmeal too, so it’s a win-win. I do overnight oatmeal in the crockpot. It makes so much I then portion it into cup portions and stick them in the fridge for future breakfasts. You top it your way on the day you eat it and only microwave it a short time when you eat it. We have an overnight egg bake we like to make, although I’ve never tried to freeze it. Wouldn’t the eggs become watery? Why did I never think of this!!! I always do breakfast for dinner because I am not a morning person or someone who wakes up ready to cook. So last night I made the casserole (I added spinach and onions), and the giant cookies. Loved it! !